The bassist looked like a cross between Slash and Iggy Pop. So the band came out and started their aural assault on the crowd. The crowd really seemed into it (but then, maybe everybody was into just because it was one of those rare occasions where you can wear your three foot high mohawk and people would give nods of approval rather than rolling their eyes, or shielding their children). I was mainly just confused, and stubborningly holding out hope for some heavy metal bluegrass in the middle of the song. Now, some of you readers may be scoffing at the notion of heavy metal bluegrass. My love of bluegrass is well documented on this blog. Same goes for my love of alternative forms of bluegrass. In fact, certain blog readers will recall my days as the manager of the infamous, debaucherous, peerless (naysayers may claim "wholly" "fictitious") China Man Bluegrass Band. I managed them starting from their legendary Shanghai Lonesome Sound Tour to the day of that untimely and fiery crash that ended the band in Sandusky, OH. Playing Chinese Bluegrass in the middle of Sandusky, OH. While it may or may not have actually happened, that, my friends, is Alternagrass. Around the same time as CMBB, I fell into the Bloodshot Records scene with Split Lip Rayfield and others playing that indie-rock-country-punk for which the label is known. I'm telling you, in the early 2000s cowboys with tattoos screaming Hank Williams songs was way more dangerous than MTV generated gangsta rap. And that's probably still true today. So all of this is a roundabout way of saying that Heavy Metal Bluegrass seemed completely plausible to me. I'm not sure how this music is officially classified by those on the internet who have finely calibrated music labeling apparatuses (apparatti?). Does this music qualify as screamo? I think it does. The lead singer is very emo. I don't know if he's emo in real life, but when he steps on stage he has the role of Emo Lead Singer down pat. But he also really reminded me of the lead singer of local heroes Magic Bullets. As by this I mean he was insanely frantic the entire set. FTM left the stage, and all the mohawks went wild for the next band. But two songs into the headlining act I left Slim's, head down, slightly dejected. I guess heavy metal bluegrass will have to wait for another day. Until then, I still have Cookie Mongoloid. I thought that today I would add a little more meat to the bones of yesterday’s post. I want to look at the mechanics behind the royalty rate increase "controversy." The first thing to think about is how the Copyright Act is implicated when you, e.g., listen to a CD (I know that it is so old school to actually listen to CDs, but just play along). There are at least two copyrights in a CD: first, there is copyright in the "musical work" (what you think of as "the tune," both the underlying arrangement of notes and any accompanying words), 17 USC 102(a)(2); secondly, there is copyright in the "sound recording" (the actual recorded sound that comes out of your speaker), 17 USC 102(a)(7). The copyrights are not necessarily held by the same party: copyright in the musical work is initially owned by the party who wrote the music – the composer and lyricist – while copyright in the sound recording is initially typically held by the producer who arranged for the song to be recorded. Of course, the holder of the right may be determined by contract, with the record label often owning at least the latter copyright, if not both. Okay, so now that we understand that there are two distinct copyrights in play, what rights actually attach to these copyrights? Copyright owners hold four basic rights, the right to: reproduce, prepare derivative works, distribute, and to publicly perform. 17 USC 106. The "musical work" copyright gets all of these rights. The "sound recording" gets the first three, and a modified version of the fourth. The modified version is the right to perform publicly by means of a digital audio transmission, and this right did not come into being until the Digital Performance in Sound Recording Act of 1995. So what does all of this mean? Well, let's go through an example. When a terrestrial radio station plays a song, it is publicly performing the musical work and the sound recording. It pays the song writer (or whoever owes the musical work copyright) for its use of the copyrighted musical work, but it does not pay for its use of the copyrighted sound recording. Why? Because copyright in sound recording only applies to digital transmissions, which by the terms of its definition in the Copyright Act exempts terrestrial radio. When an internet radio station plays a song, it has to pay for use of both of the copyrights. Arbitrary, you say? Of course it is. But, anybody who has ever paid taxes or been pulled over for speeding when every car around them was going faster has experience with an arbitrarily written or enforced law. Arbitrary laws are nothing new in this country. But to be clear, this sound recording performance right result cannot be justified on the basis of copyright law; it is solely to be chalked up to the power of the terrestrial radio lobbying efforts (let me repeat this for all of you out there who think the recording industry is the root of all evil: radio broadcasters using the political process to reach a result that is favorable for their side, but that makes no sense from a legal standpoint). The rate increase "controversy," then, is dealing with the price of that digital sound recording performance copyright. Webcasters (as is true with the musical work fee paid by terrestrial radio broadcasters) pay one statutorily based rate - a per performance "compulsory license" -- for each performance, rather than having to negotiate a different rate for each performance (if I didn't write that sentence clearly, think of it this way: rather than broadcasters having to negotiate, and therefore pay a lot more, to play an Elvis Presley song than an Elvis Perkins song, there is a single rate that is paid per performance, regardless of the song). The Copyright Act provides a mechanism to reach that royalty rate. First, it encourages the copyright holders and the internet broadcasters to privately negotiate and reach a desirable rate on their own. 17 USC 114(e). Only after these negotiations fail do both sides come before a Copyright Royalty Judge who commences trial-type proceedings, 17 USC 114(f). This means that both sides put on witnesses and evidence, just like they would if they were having a trial, and at the end the Copyright Royalty Judge comes down with a ruling. So let's apply this to the "controversy" at hand. At first, the copyright holders and broadcasters came together to negotiate. Some of the initial members of the internet broadcasters included: Microsoft, America Online, Yahoo, and Clear Channel Communications (it is worth keeping this in mind when you see coalitions such as Save Net Radio framing the issue as Big Govt vs. Mom and Pop Radio). Both sides presented a proposal, bolstered with evidence and witnesses. Included among the internet broadcasters' witnesses included economics professors, finance experts, and corporate executives. At the end of the trial, the Copyright Royalty Judges (there were three that presided over the hearings) came down with their ruling. In this case, the copyright holders proposed a rate of either 30% of gross revenues or a per performance rate starting at $0.0008 and increasing to $0.0019 by 2010 (the statute calls on the Copyright Royalty Judges to set rates in five-year blocks), whichever was higher. The internet broadcasters offered various revenue-based percentages, and various per performance rates, starting at $0.00025 per performance (so note that when critics of the fee increase call the rate "outrageous" they are talking about a difference of $0.00055 per performance; I'd calculate the percentage difference in those two numbers but I don't have a calculator that allows me to enter that many digits on the right side of the decimal point). Both sides presented their proposals and evidence and witnesses, and after a 48-day hearing, the judges came out with the numbers I presented yesterday. The biggest complaints I've read regarding this "controversy" are that this is an example of Big Govt v. "Little Mom and Pop" and that the music industry was the only player in setting the rates; that somehow the internet broadcasters were not at the table in the rate setting discussion. Plainly, both of these are just false. And, on a personal note, whenever I see shadowy coalitions talk about "Little Mom and Pop," and then fail to mention that "Little Mom and Pop" includes parties such as Microsoft and Clear Channel, I start thinking that the "controversy" is nothing but a big budget PR campaign (see, generally: smoking is not bad for you, presented by shadowy coalitions brought to you by tobacco companies; lawyers are bad for you, presented by shadowy coalitions brought to you by insurance companies). Think what you want to think about these rates, leave me comments, email me, etc. But at least take a few minutes to read the ruling before you buy into the conspiracy. Reading Rules Before Complaining About Them. I don't know how your web surfing has been going lately (btw, do people even use that word anymore -- websurfing? So quaintly 90s, right?) but I'm growing increasing exasperated at all these blogs complaining about the Copyright Royalty Board's implementation of new royalty rates that webcaster's must pay to play music. A bunch of web radiocasters engaged in a Day of Silence in protest. Coalitions have been formed, to get people aware of the "problem." Here's the thing. Go ahead and Google this problem. What do you come up with? A bunch of blogs complaining of "outrageous rates" that are "putting webcasters out of business" and "taking food out of people's mouths" by charging "more in fees than we can possibly make up in revenue." Which is all very concerning. Except that none of the blogs or articles say what the rates are, or what the rates were, or how much money they are losing. Editor's note: this is not a good way to convince people of your point. $0.0008 per performance, 2006 (the fees are retroactive). ...it would be awfully hard to work up the energy to write passionate blog posts about zeros and zeros of cents. But it's much easier when we can scream : the govt is interfering with our lives, harming the little guy and making the rich richer! Editor's note: Everybody stop your damn screaming. Read the opinion first. I'll be sure to wake you up in the middle up it, because I'm pretty sure you'll fall asleep reading it -- it turns out the reality is much more boring -- and much less outrageous -- than the screaming blog posts suggest. Copyright Royalty Judge -- Final Determination of Rates & Terms -- pdf. She's like an artistic octopus: filmmaker, performance artist, musician (on no less than Kill Rock Stars), writer, and at least four other things to make the analogy complete. Her new collection of stories is "No One Belongs Here More Than You," and while it is still currently merely on my "To Read" list, I have unrealistically high hopes based on its promotional website -- easily one of the most perfect uses of the internet ever. Seriously. Miranda July -- No One Belongs Here More Than You -- website. Brian Michael Roff, the track "The Underpainting" from the album "The Underpainting" (CSP, 2007). This is a lovely song that magically appeared in my email this morning, from the vital Cat Bird Records. So I wanted to share it with all of you. Brian Michael Roff -- The Underpainting -- mp3. 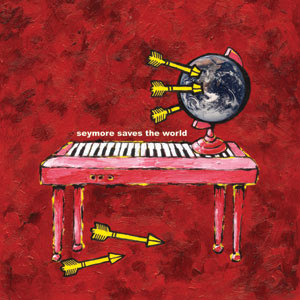 Seymore Saves the World, s/t (Royalty, Etc. Records, 2007). 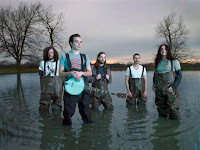 Seymore Saves the World is my Band of the Month for June. Here's how it came to be. So, everybody who has a Myspace page gets about ten friend requests each day from bands. As a fan of music, I have no problem taking a few minutes out of my day to go to the band's page and listen to what they have streaming...before usually cringing, denying the invitation, and never thinking about the band again (I know, I'm a horrible person, but I'm only one person, and there is a fixed amount of room in my head to store the constant onslaught of information we are given everyday. I'm trying, people.). I try to be an optimist with things like this, but sometimes the sheer volume of requests gets on my nerves. So then I started a new policy: anytime I get a friend request from a band, I reply saying if they send me a copy of their CD/demo/whatever, I'll take a listen and review what I receive. So enter Seymore Saves the World. I shouldn't be surprised that the first band to take me up on the offer would be from Minneapolis, home of reasonable people and great rock bands. And for the amount of crap that one wades through on Myspace, I've been pleasantly surprised with this album. I received it way back in the long-ago days of May, but have designated them as my Band of the Month for June, because they have a classic summer sound. Very pop-rock, with keyboards, and "do-do-doo" harmonies. They could be played in the Two For Tuesdays slot on any Classic Rock Station in the country without the listener realizing that the classic sound is being made in the Here and Now. And there's something to be said for that. Seymore Saves the World -- Summer 2005 -- streaming audio.